ASKO’s Single Pull Out Shelf makes loading and unloading easy. Simply pull it out and use it to fold your laundry on. Once finished, slide it back in and hide it away to leave your laundry neat and tidy. 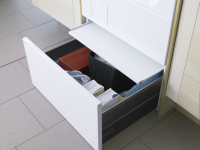 ASKO’s Pedestal Drawer is an innovative storage solution for any laundry. 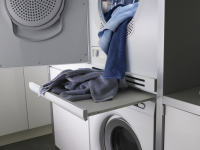 Hidden underneath your bench, washing machine, or clothes dryer, you can use it to store essentials like detergent, clothes hangers, or pegs, and if positioned under your washing machine or clothes dryer it elevates your washing machine or clothes dryer by 30cm, making loading or unloading easy.